Laurie Ellis's Rennmax BN1 chassis, his second Britton-built car. Copyright Kevin Davis 2012. Used with permission. 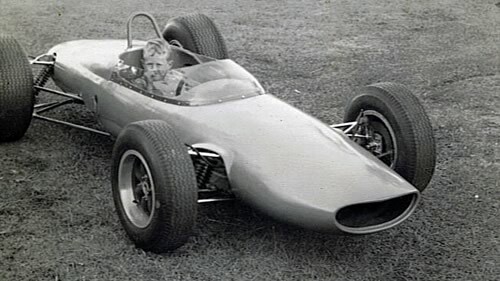 Bob Britton set out to build a Lotus 20 copy from photographs and measurements but, after the first chassis had been built, he was able to get a Lotus 22 to copy and built a jig from that. A further six cars were built from that jig. The BN1 was essentially a Lotus 20 with Lotus 22 suspension. A total of eight cars are shown here but Mal Cooper's disappears early so one of the later cars could be second-hand. Thanks to Ray Bell and Bryan Miller for their help constructing these histories, to Kevin Davis for sorting out the two Laurie Ellis cars with the help of Laurie and Roger Ealand, to Harry Hickling for details of his car and for the photograph, and to Kevin Taylor for details of his car. All and any help would be gratefully received. Please e-mail Allen at allen@oldracingcars.com if you can add anything. The ex-Tony Reynolds Rennmax BN1 chassis as bought by Kevin Taylor in 2013. Copyright Kevin Taylor 2013. Used with permission. AJ 'Tony' Reynolds (first recorded outing 7 Jun 1964; initially 1098cc and green/yellow). Later to Max Stewart (initially 1098cc and green): Warwick Farm 13 Feb 1966, Warwick Farm 19 Feb 1967 (1098cc and red); re-engined with 1498cc twin-cam (and now red): Warwick Farm 14 May 1967, Warwick Farm 16 Jul 1967, Warwick Farm 10 Sep 1967, Warwick Farm 3 Dec 1967 (shared Australian Formula 2 championship with Garrie Cooper in 1967). Sold to John Christian (Braddon, a suburb of Canberra, Australia) Feb 1968 and entered as an 1100cc in 1968 but crashed at Warwick Farm that year and put to one side, unrepaired. According to the CAMS logbook (N878 issued 13 February 1968), it was sold by Christian to Dean Rainsford (Dudley Park, South Australia) in Oct 1990. Restored by Rainsford for Australian FJ historic racing in 2002 but not believed to have been raced. To Kevin Taylor (Maida Vale, Western Australia) May 2013. Expected to return to historic racing in 2013. It has been reported that the second Ellis car was originally built by Bob Britton for Geoff McClelland 1962 as a rolling chassis but never completed.